The demands on connection technology for wind energy are high. With tower heights now well over 100 meters, copper-based Ethernet connections are reaching their limits. The solution for longer transmission distances is called "fibre optic" (FO). However, these fiber optic links in a wind turbine are subject to particularly stringent requirements. FO between the blades and nacelle must be pluggable in order to reduce service and maintenance costs. In addition, fiber endfcaces with angled physical contact (APC) technology are employed in measuring technology applications to optimize return loss. 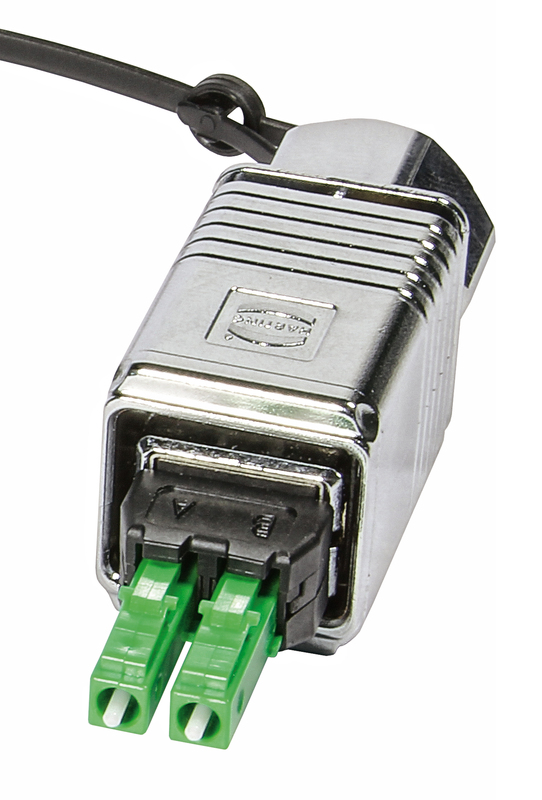 However, pluggable connectors with APC were previously only available in the IP 20 protection class, resulting in the additional use of encapsulated housings. With the development of a complete wiring solution between the blades and nacelle in protection class IP 65/67, the need for further housings is eliminated, which significantly facilitates handling during assembly and maintenance. Moreover, the metal version of the PushPull connector provides additional mechanical protection. The HARTING PushPull fiber optic family has also been supplemented with additional product variants. The PushPull Extension Cord Adaptor offers a rugged connector interface to extend PushPull cables: that can be glued onto a plate in the blade. In addition, a Y-cable has been developed. The duplex cable is divided into two simplex cables directly behind the connector by a Y junction, in order to implement the optical loop in the blade. HARTING PushPull was previously limited to standard physical contact (PC) optical inserts. PushPull LC Connector with diagonally polished contact surface. Thanks to a special assembly method, single-mode assemblies with angled physical contact (LC APC) are now available as well. These impress with extremely low attenuation values (&lt; 0.25 dB) and very low scattering of attenuation in different cables. Reference measurements are required for operational startup. In order to reduce the effort associated with these measurements, HARTING Technology Group has developed a PushPull “optical short circuit” loop connector. Other accessories such as protective caps and locking clips are also provided in order to prevent the accidental opening of the PushPull connector.